The most awaited and the blessed month of Ramadhan has finally come and i would like to wish Ramadhan Mubarak to all the Muslims across the globe !!!! Its been almost an year since i wrote something...With the arrival of another little bundle of joy at home, I have been totally neglecting this one for indeed a very long time. My blogging buddies have been so kind to me and their emails have been so encouraging and supportive during my absence that I would like to thank one and all for it. 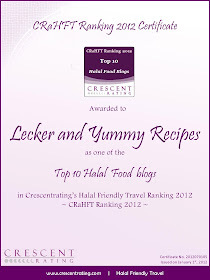 With Ramadhan here, the blogging world eagerly waits for the Iftar Moments hosted by my close friend Umm Mymoonah of the Taste of Pearl City. Iam sure every one would be as excited as Iam.. This event definitely holds a special place for me. Though I kept myself away from blogging, I cant and I dont want to miss participating in this wonderful event... can I?? 1. 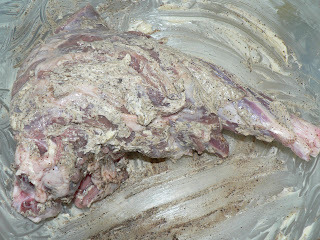 Spread 50 gms butter and ground pepper and rub it on the lamb leg thoroughly. 2. 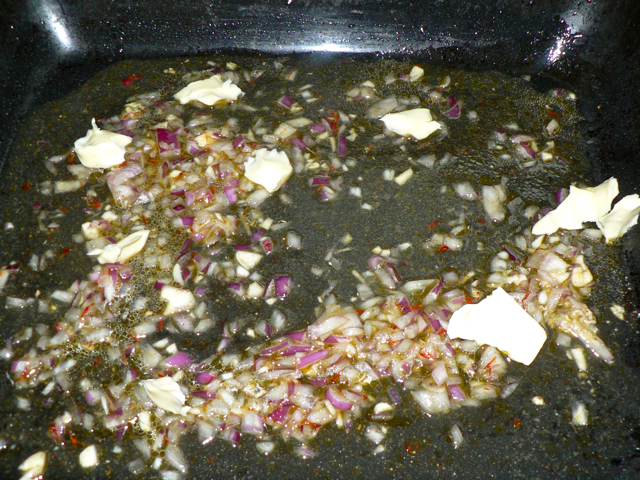 In a separate bowl, mix well the chopped onions, garlic, all the spices, olive oil and a little water. 3. 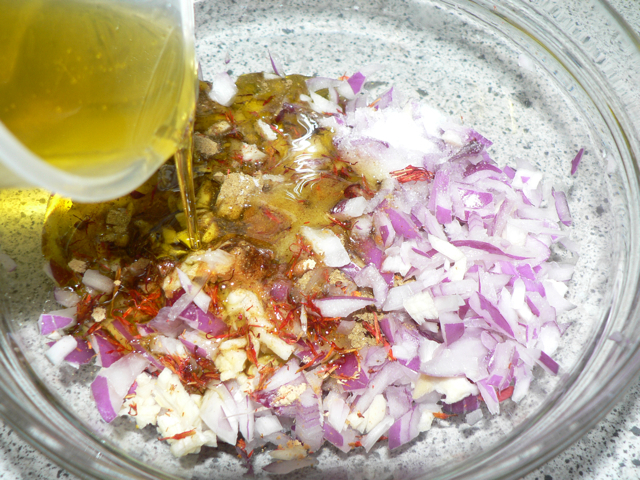 Take half of this mixture and spread firmly on the buttered meat. 4. Pour the other half of the onion mixture and the rest of the butter in a large baking pan which should be large enough to accomodate the leg. 5. 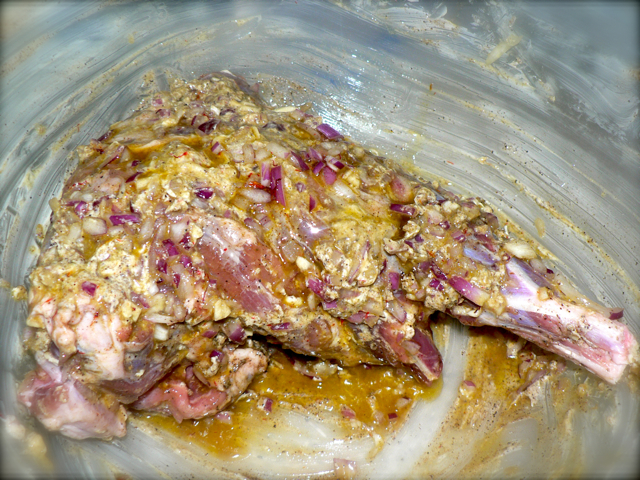 Now place the lamb leg on this onion mixture bath, cover it with a foil and marinate for minimum 1 hr at room temperature. 6. 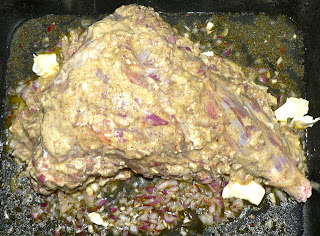 Remove the foil and slow grill the lamb leg at 175 °C for about 2.5 hrs until it turns crispy from outside and is cooked well. Every now and then, using a spoon, pour over the underlying onion juice on the lamb during grilling. 7. Using a sharp knife, cut it in slices and serve it as a steak with rice or bread. 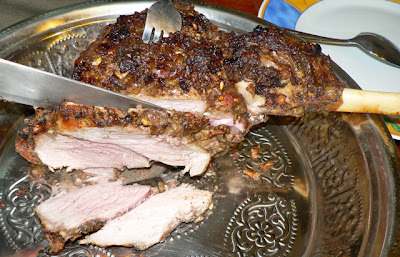 I bet this juicy and grilled lamb-leg is a nice treat for the meat-lovers ! 1. 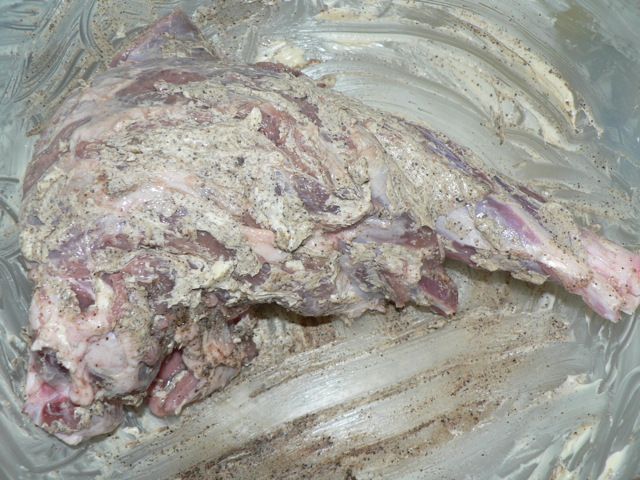 If the meat is uncooked, you could regrill it in the oven for another half an hour or so. 2. 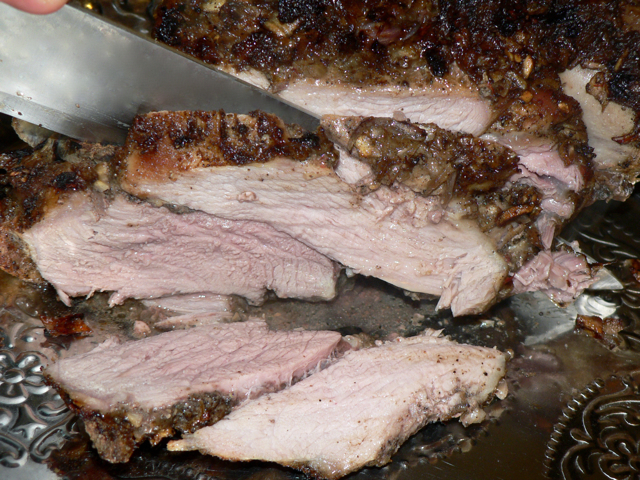 This grill time varies according to the size of the lamb leg in different countries. Please adjust the time accordingly. Best wishes for the Ramadan and what a great recipe for the occasion !! Reminds me of great Ramadan days in Kuwait where I used to stay with my Muslim colleague. I like the recipe and the detailed method. 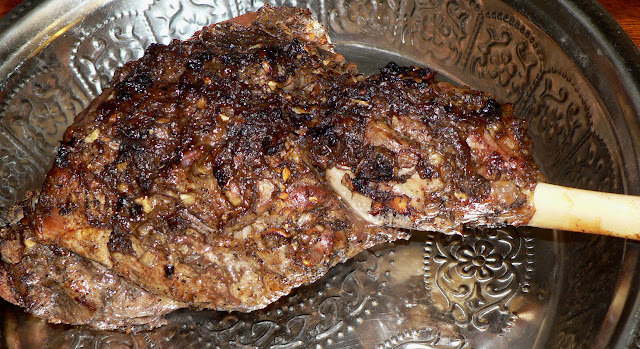 I have grilled beef steaks with Indian spices, but never tried a lamb leg. I have a good mind to try it out. nice post .. looks so delicious .. thanks for sharing ..
Luce delicioso y belllo,es mi asado preferido,así de jugoso,abrazos grandes.